Freaky Bird is a great app for Windows 8 and 8.1 which is a Flappy Bird like game for your device. When you launch the game you will be taken to its main menu where you can toggle the sound on or off, start a new game etc. 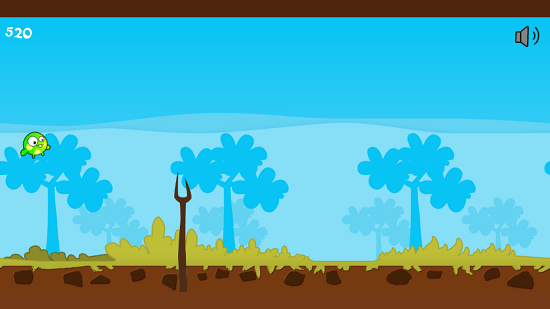 When the game is started, you can keep the bird afloat by tapping constantly on the screen or by clicking the left mouse button or by tapping on the up arrow button. The faster you tap the button, the more the bird is kept afloat in the air. The game has certain power ups that allow you to get through to a high score. 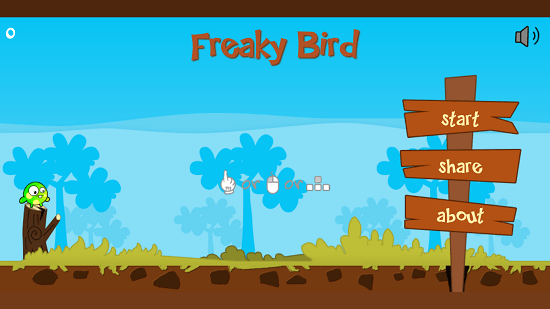 Freaky Bird is available for free from the Windows App Store. When you run the app, you will be presented with the below shown screen. In the above screen you can toggle sound on or off at the top right corner of the screen. You can click on the Start button at the right side of the screen to start the game. You can see the gameplay shown in the screenshot below. In the above screen you can see your score at the top left corner of the screen. You can also toggle the sound by clicking on the loudspeaker icon at the top right. 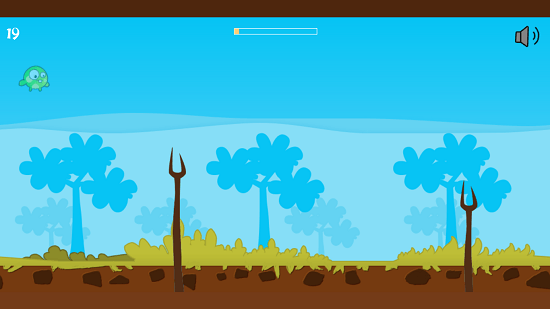 An invisibility powerup which has been activated is seen in the screenshot below. This power up allows you to fly through obstacles. When you crash on an obstacle, you will be presented with the game over screen. From this screen you will be able to restart the game, share your score etc. This is a wrap of the main features of Freaky Bird for Windows 8 and 8.1 devices. 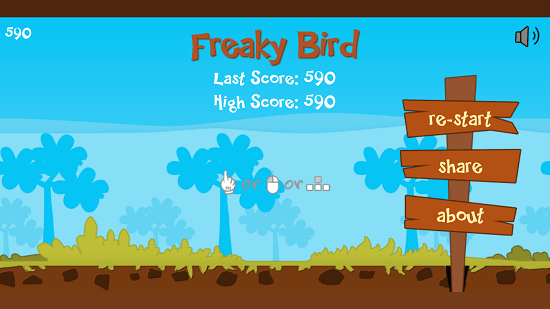 Freaky Bird is a great game app for Windows 8 and 8.1 which allows you to while away your time even if you are offline. The game is very lightweight and is available for free from the Windows App Store from the link below.